America’s best-selling passenger car for more than a decade is more attractive than ever as it enters its eighth generation. 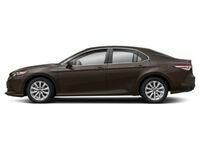 Armed with a fun-to-drive performance, an all-new athletic style and an arsenal of standard features, the redesigned 2018 Toyota Camry near Bangor, ME is the total package. Expected to arrive at dealerships in the summer of 2017, the 2018 Toyota Camry promises to be a best-in-class model in the midsize sedan segment. Visit Downeast Toyota today to learn more about the 2018 Toyota Camry! When the 2018 Toyota Camry arrives, it will be available in LE, XLE, SE and XSE trim levels, will employ Toyota New Global Architecture, will feature Toyota Entune 3.0 and will be equipped with all-new powertrains. A longer, lower and wider platform creates a distinct connection with the road and is reinforced by sleek lines, striking character and bold style cues. Highlight elements of the next-generation Toyota Camry design include a two-piece grille, a sculpted hood and a reinvented interior. Armed with an all-new and athletic design, the 2018 Toyota Camry near Bangor, ME is an automotive masterpiece that is sure to impress car shoppers when they get behind the wheel. The athletic next-generation family sedan is made even more attractive with the addition of innovative new powertrains to its repertoire. Expected to be more powerful and more efficient than its predecessor, the 2018 Toyota Camry delivers a world-class ride in an affordable package. 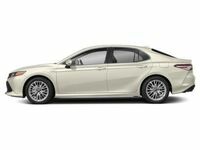 Base Toyota Camry editions will employ an all-new 2.5-liter inline-4 Dynamic Force Engine that is mated to a Direct-Shift eight-speed automatic transmission. Developed to manufacture higher torque, higher horsepower and higher fuel-economy numbers, the four-cylinder Toyota Camry promises plenty of thrills. Drivers who opt for the Toyota Camry Hybrid will benefit from the all-new Dynamic Force Engine paired with a continuously variable transmission to achieve ultra-efficient fuel-economy numbers. Performance enthusiasts who thrive on horsepower and torque can opt for the new 3.5-liter V-6 power platform that features Toyota D-4S direct and port fuel injection to amp up power. When the 2018 Toyota Camry arrives at Downeast Toyota, it will come complete with a laundry list of innovative features and next-level technology. Toyota Safety Sense collision-prevention systems will be a standard element of the Toyota Camry model lineup, adding a Pre-Collision System with Pedestrian Detection, Dynamic Radar Cruise Control, Lane Departure Alert with Steering Assist and Automatic High Beams to the spec sheet. Entertainment and connectivity get a boost with a Toyota Entune 3.0 multimedia interface. Entune 3.0 adds standard Connected Navigation, App Suite Connect, Remote Connect, WiFi Connect on-board internet and an available JBL® premium sound system. A futuristic 10-inch color Head-Up Display pairs with a multi-information display to provide convenient access to vital driving information when you get behind the wheel. Keep an eye on the Downeast Toyota inventory for the arrival of the 2018 Toyota Camry later this summer!